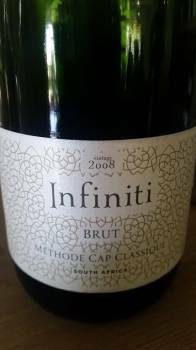 I was a member of the panel that judged this year’s Amorim Méthode Cap Classique Challenge, and when the unheralded Blanc de Blancs 2013 from Durbanville property Altydgedacht emerged as overall winner, I was surprised as anyone. The Cap Classique Association has a policy of not disclosing the Challenge pouring order to judges, which does nothing to further the debate around the category and I’m busy lobbying the relevant decision makers to rethink this, but until such time, I would make the general observation that if the plethora of new entrants into the market some five or so years ago meant that overall level of quality dipped, this has now risen again to a point were just about everybody is making at least a passable bubbly. This was born out again when tasting the Infiniti 2008 from Stellenbosch Vineyards. A blend of 95% Chardonnay, 3% Pinot Noir, 2% Pinot Meunier, it spent six years on the lees. It shows citrus, green apple and peach plus quite a strong but entirely pleasant yeasty note. The mousse is fine and not too vigorous, the finish very dry. Not super-complex but more than just technically sound. Price: R140 a bottle.